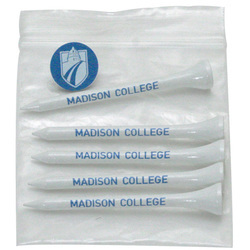 10 - 3 1/4" Golf Tees & 2 Ball Marker Packaged in a Reusable Zip Lock Poly Bag. 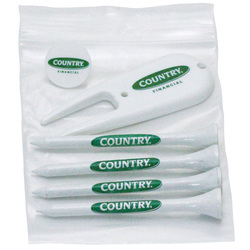 Great for Handouts at Trade Shows, Golf Tournaments, etc. 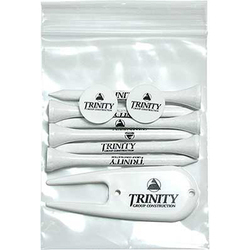 5- 3 1/4" Golf Tees, 1 Ball Marker and 1 Divot Tool. Packaged in a Reusable Zip Lock Poly Bag. 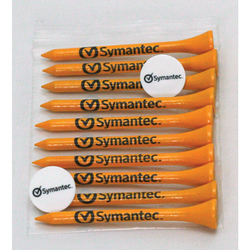 Great for Handouts at Trade Shows, Golf Tournaments, etc. 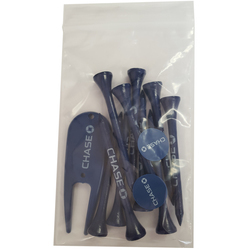 6- 3 1/4" Golf Tees, 2 Ball Markers and 1 Divot Tool. Packaged in a Reusable Zip Lock Poly Bag. Great for Handouts at Trade Shows, Golf Tournaments, etc. 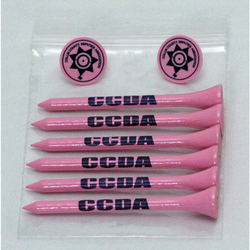 10- 3 1/4" Golf Tees, 2 Ball Markers and 1 Divot Tool. Packaged in a Reusable Zip Lock Poly Bag. 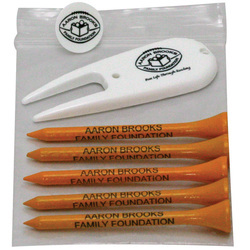 Great for Handouts at Trade Shows, Golf Tournaments, etc. 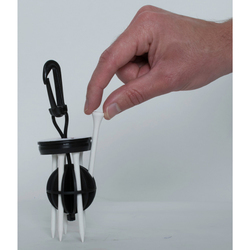 Clip the patented CaddyCap to your golf bag for quick and easy access to your golf tees. Simply slide the cap upward to remove a tee. CaddyCap clear tube with black cap includes: six 2-3/4″ or 3-1/4″ white wood tees. Price includes a full color epoxy domed cap.